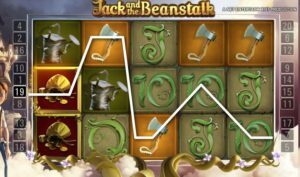 Enter the fairy tale, climb on the beanstalk and reach for the gold in Jack and the Beanstalk slot game from NetEnt. If you haven’t met Jack before – now it’s your chance, in our review, we will show you all the main features of this casino slot. walking wild – each time you hit the wild symbol you will be rewarded with the re-spin, re-spins will continue as long as a wild symbol is visible on the reels. All winnings with wild symbols are with x3 multiplier. Walking wild feature appears during the normal play mode and in the free spins mode. free spins – to enter free spins game round you need to hit three or more scatter symbols, maximum amount of free in spins that you can win in normal play mode is 10, if you will hit another three or more scatters during the free spins game round you will then be rewarded with additional 5 free spins. treasure collection – during the free spins you will collect the key symbols, they will appear only on reel 5, if you will collect 3 key symbols you will get Money Bags wild feature, for additional three keys you will get then wild feature and if you collect all 9 keys you will get the best wild symbol – harps. Harps wild feature will extend every wild which you will hit during the free spins to cover the whole reel. If you will be lucky to hit few of them in a row then you can already start celebrating. For sure you will get some nice juicy win. Jack and the Beanstalk slot is on our list with TOP 50 games from NetEnt with highest RTP! If you want to climb on the beanstalk with Jack I have something that will help you with that. You can now get your 20 free spins in Jack and the Beanstalk without a deposit. Simply hit the button below and start playing.